Awesome thread. Here is mine. Was gonna post a PIC but I haven't posted enough. Sorry. FYI, I put my Hyper TT up for sale in the classifieds. $99 + shipping each or $198 shipped for the whole load. 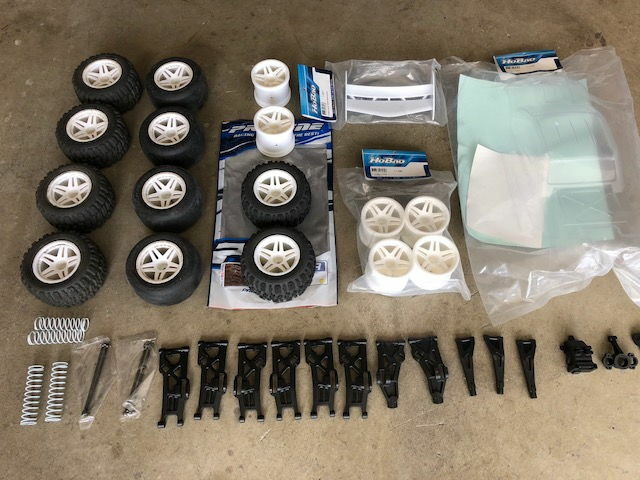 Hobao/Ofna Hyper TT + boatload of parts! 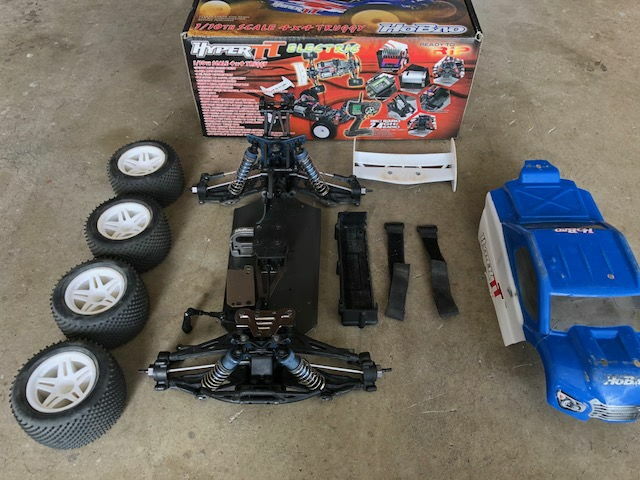 Oh man... very tempting to buy that setup from you RazorRC! I sold my brand new never ran 10TT a few weeks ago to a local and just finished helping him tune the truck at the track this past weekend, where I drove it for the first time on turf... and lets just say I've got sellers remorse! That truck is so dialed, it drove just as nice as my Tekno EB410 with comparable lap times, folks were definitely asking questions about the truck by the time I finished with the pack that I ran... I literally didn't want to give the controls back to the new owner, ha! LMK if you want it, and I can ship it out next day. Thanks for all the help you have given my son and I with the truck Bill. He absolutely loves it. I went ahead and grabbed RazorRC's Hyper. That should cover us on our parts for a long time to come. See you at the track! Ordered up the nylon spur and a screw kit. I still need to attach that aluminum brace to the front. I just joined this elite club and ordered one of these bad boys. After searching around trying to find something that fit most of my needs, I ended up buying one. Now I have to absorb as much info from this thread as I can. I'm in for a long night. Anyone have experience with the stock RTR electronics? I have read that they are 3S safe. I didn't keep the stock electronics very long. It's a re branded HobbyWing. Also keep in mind that it does not have LVC. I guess Hobao updated the electronics at some point. My truck came with a rebranded Hobbywing 60 amp ESC and a program card. The default cutoff was set at 3.2V, so I upped it to 3.4V and it seemed to work well. The manual had an insert that said that the ESC fan was rated for a 2S lipo and that a 3S lipo would burn it out. It included the info to buy the upgraded 3S fan. It's just odd. Maybe I will wire this stock fan into the receiver and not worry about it. I exclusively run my off road vehicles on a dirt oval track at my local hobby shop. 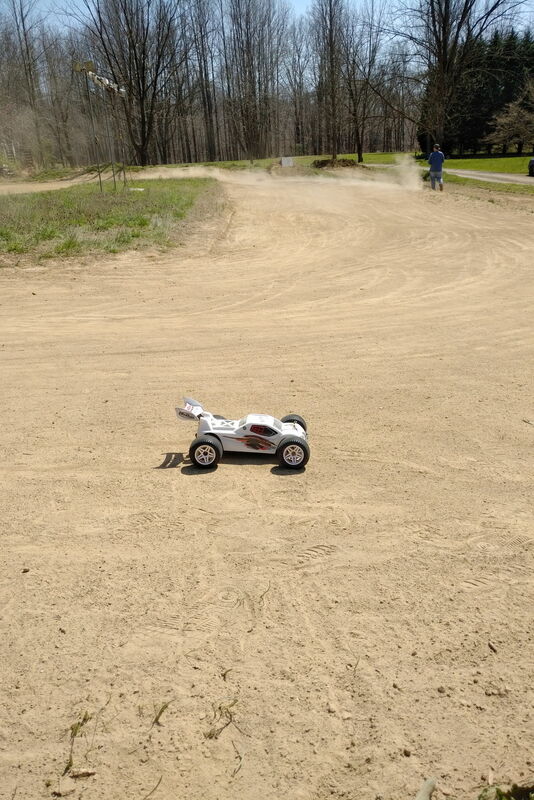 I also have a much larger dirt oval that we all use as a practice track. I took the Hyper TT to the practice oval yesterday to put it through the paces. As mentioned in my previous post, the manual says that the truck was 3S capable, but you have to change out the ESC fan to the upgraded version. So because of that, I ran 2S all day. The practice track we use is a large oval with extremely loose dirt. Did I mention extremely loose dirt? Clouds of dirt and zero traction are commonplace. The Hyper TT was an absolute beast. 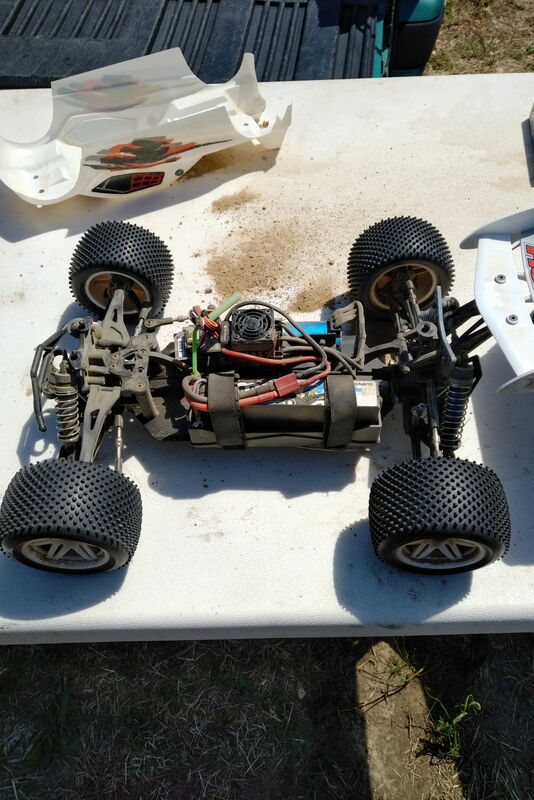 Box stock with no mods, I was able to breeze by short course trucks, Axial Yeti's, and Baja trucks. The Hyper TT tires hooked up really well and the truck handled great in this environment. I was really impressed. For such a large track, I almost felt like a need to move up a pinion tooth or two, but I will resist the urge since the nicely groomed track that we frequently race at is much smaller with tons of grip. - I love the noisy drive train. It is very unique. - Plenty of get up and go power. - All of the RTR electronics were smooth and felt good. - Stock radio feels really cheap and just barely gets the job done. This is a known issue and I'm really surprised that HoBao hasn't addressed this, earlier in the thread I posted some tips on how to bend a custom ackermann bar to get equal throw in both directions, I also showed how you can grind the front pivots to get even more throw. After the mods I was able to get the same amount of steering as my EB410 and turned comparable lap times... the 10TT can be made to be extremely competitive.... they just need to hire some pro's who know what they are doing to make a few tweaks to the design... personally I'd rather see them switch to a C-Hub design if I had any influence. Thanks for this info. I read through most of this thread, but it was difficult due to the overwhelming amount of info. I wish I could collect and organize the tips and tricks and maybe send it to the OP to add to his original post. I love when threads have all of that great info readily available. I'm going to find your posts and get these mods done. It's hard to believe that this model doesn't get the sales it should. I was really impressed. Now granted, we practice with a "run what you brung" mentality, so the competition was a hodgepodge of different trucks, but the truggy was the fastest one out there. It will be interesting to see if I can get the same results on the smaller, well groomed track. I love the open classes that my track holds. It is a ton of fun racing against anything and everything. I think this truggy will be my main focus this summer.